Private sector job growth saw a sharp rise for the second month in a row. The City’s economic output accelerated through 2016. New building projects continued to slow. Residential rents dipped for the eighth consecutive month while home sale prices continued to rise. Public transit ridership stabilized after several months of decline. Private sector employment rose sharply for the second consecutive month in June 2017. After growing by 30,800 jobs in May, the City’s private sector added 31,500 in June1. More than a quarter of net gains in June were in Educational Services—a historically volatile sector—which added 8,700 jobs. Professional Services and Accommodation and Food Services each added more than 6,000 jobs, a record high for both sectors. Gains were not seen in the Trade and Transportation sectors, with Retail, Wholesale, and Transportation, and Warehousing each shedding jobs in June. The Trade sector employment is down by 1.7% from last year. The percentage of unemployed City residents rose for the third consecutive month, reaching 4.4%, up from 4.3% in May. The City’s unemployment rate matches the national rate and is slightly lower than New York State’s 4.5%. At the same time last year, the City’s unemployment rate was at 5.3%. Labor force participation, meanwhile, rose for the sixth consecutive month as more New Yorkers began searching for jobs, up 0.1 percentage point to 61.7%. Hourly wages increased from the previous month to $34.85, up 3.1% from last year (after adjusting for inflation). Average weekly earnings in June also rose 2.5% from a year prior, the strongest increase since April. The increase in hourly wages was dulled slightly by continued declines in hours worked. The average earner worked 34.0 hours in June, down 0.2 hours from last year. The gross city product expresses the total value of goods and services produced in New York City. 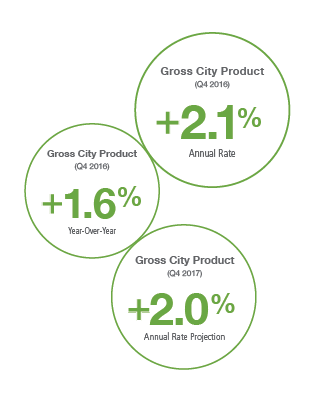 Gross city product grew at an annual pace of 2.1% in the last quarter of 2016, reaching $683.2 billion, the fastest annualized rate of quarterly growth since the third quarter of 2014. This follows five consecutive quarters of accelerating economic growth. 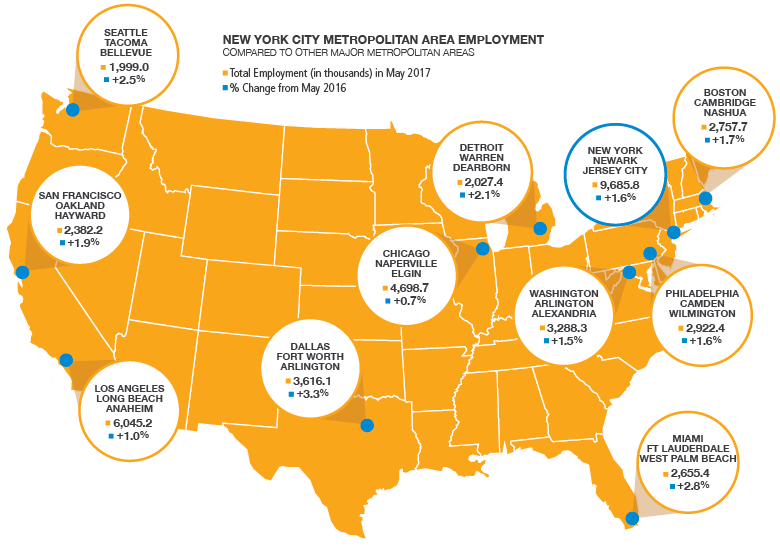 Moody’s Analytics projects New York City’s economy to grow at about this rate through the end of 2018. The recent uptick in economic growth has been led by Manhattan, a reversal from the last two years when Brooklyn led the growth. New York City’s construction slowdown continued in June. The number and value of construction units that started in June were 50.1% and 43.7% lower, respectively, than the twelve-month averages ending in May. This is the fifth consecutive month that has fallen short of prior-year averages, which were driven up by strong construction activity from the fourth quarter of 2016 through January 2017. The decline in residential construction was modest by comparison, with the number of units starting construction in June down 17.3% from the prior-year average. 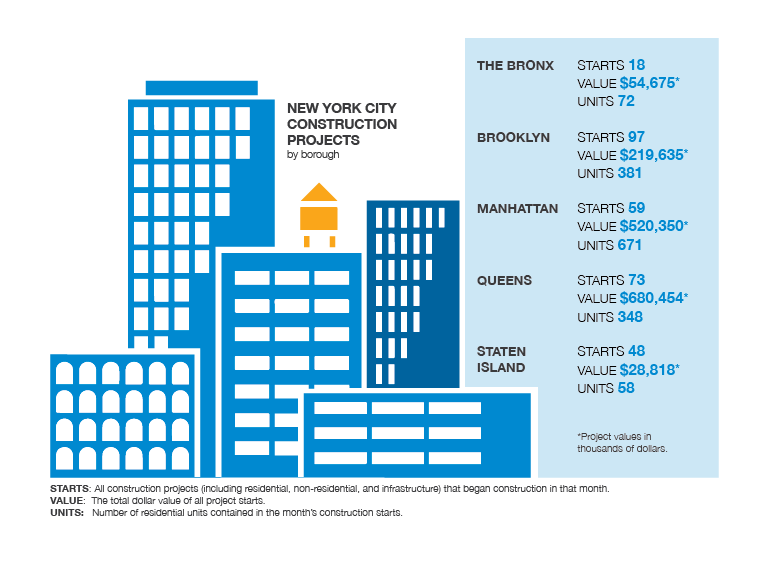 Declines were seen broadly across the City, with Manhattan leading the decreasing value of new construction projects. Residential rents in New York City continued to modestly decline in June. Median monthly rents in the City were $2,330, down 0.4% from June 2016. 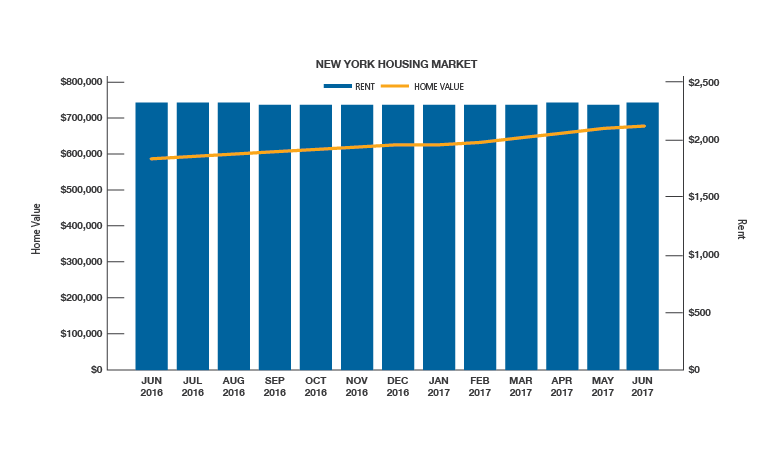 This rate of decline is unchanged from the previous month and is the eighth consecutive month that rents have not risen from prior-year levels. Median sales prices, however, have continued to accelerate. In June, average home values rose 16.4% from the previous year, hitting $685,000 – the fastest rate of growth in over a decade. Home prices and rents have been moving in opposing directions for twelve months. 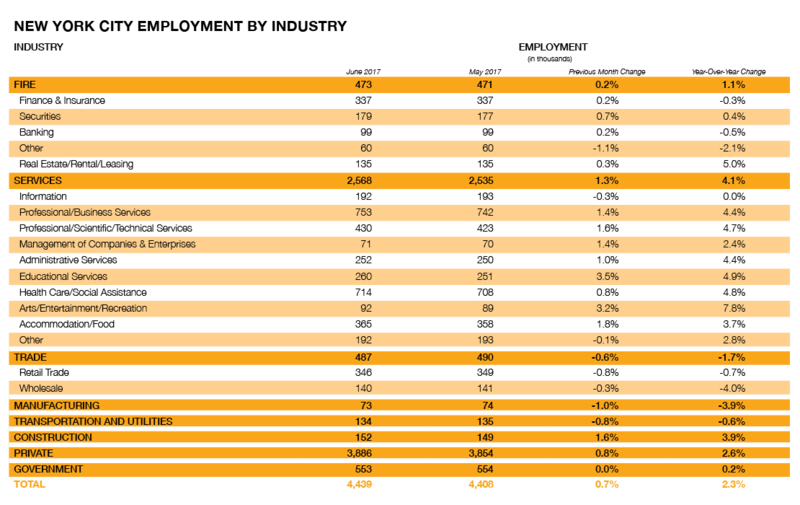 The Manhattan office market appeared to soften in June. Average asking rents for Class A buildings fell 3.1% from last year, while vacancy rates rose 0.5 percentage points to 9.2%. Despite this weakness, leasing activity increased to the highest levels in two years, reaching 7.8 million square feet in the second quarter. This uptick in leasing activity was led by new spaces and redevelopments on the West Side near Hudson Yards. 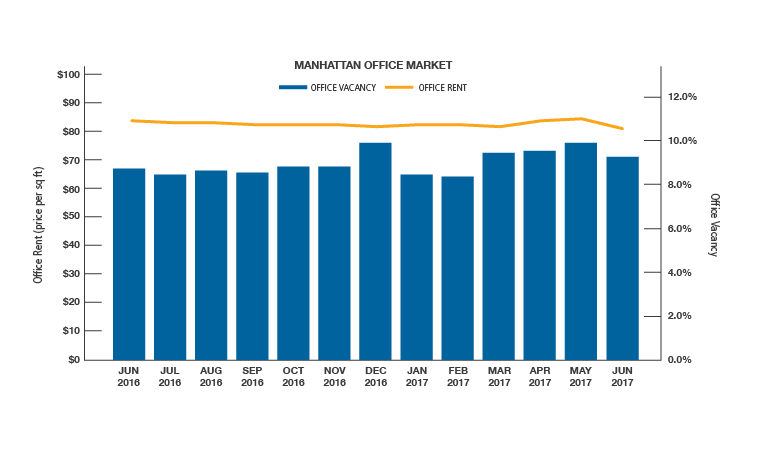 The Manhattan office market appeared to soften in June. Average asking rents for Class A buildings fell 3.1% from last year, while vacancy rates rose 0.5 percentage points to 9.2%. Despite this weakness, leasing activity increased to the highest levels in two years, reaching 7.8 million square feet in the second quarter. This uptick in leasing activity was led by new spaces and redevelopments on the West Side near Hudson Yards. Ridership on public transit systems stabilized in May 2017. Ridership on commuter rail lines rose for the first time since January 2017, increasing by 2.0% from last year. Subway ridership leveled out after three months of steep declines. Falling bus ridership, however, pushed New York City public transit ridership slightly lower than May 2016 totals. Twelve-month average ridership on public transit remains at multi-year lows. *Note: Airport and Broadway data are reported for May 2017. Hotel data is reported for March 2017.